Of all the things leaders do, talking is among the most visible and certainly among the most influential. Think about it. You don’t add your greatest value by virtue of your skill in manipulating project management software or flipping switches or turning valves. You add your greatest value by interacting with other human beings, and you do that primarily by talking. It’s amazing how many books have been written on the subject of talking. While most of them contribute to the discussion, their essence can be summed up simply: We are most effective when we talk so other people will listen and when we listen so other people will talk. Because it requires honesty and clarity, true dialogue can be uncomfortable. And because people like to avoid discomfort, it’s tempting to allow some topics to remain unaddressed—sort of like leaving a splinter in your finger even though logic tells you the temporary pain of digging it out is not nearly as bad as the likely infection from leaving it in. Most of us have been in situations where there’s a relevant issue that nobody seems willing to talk about. We might even say to ourselves, “There’s an elephant in this room, and I sure wish someone else would tame that animal.” Well, to tame an elephant—an “undiscussable”—you must first acknowledge its existence. A natural consequence of undiscussables in a culture is that fresh viewpoints get deflected, or even smothered. That’s contrary to the whole purpose of dialogue, and dangerous for any organization interested in vitality and achievement. Our recent (as well as remote) history is replete with examples of intolerance for facts that disturb the status quo. · At NASA, insulation foam falling off fuel tanks and hitting space shuttles became an undiscussable. · For Detroit automakers, the marketplace surge of Japanese cars was an undiscussable. · At IBM, Apple was an undiscussable. · At American Airlines, cross-state rival Southwest Airlines was an undiscussable. · At Kodak, digital photography was an undiscussable. · In the music industry, MP3 file-sharing was an undiscussable. · Among Michael Jackson’s entourage of hangers-on, the pop star’s drug dependence was an undiscussable. You can make your own list. Some organizations harbor veritable herds of unnamed, untamed elephants. After completing a culture assessment for a major corporation I was doing my “What? So what? and Now what?” presentation to the senior management team. That’s where I describe the results, point out the implications of the findings, and make recommendations for change. One of the findings was that the CEO had a shoot-the-messenger reputation that was stifling open dialogue on key operational issues. Within a nanosecond of reading that comment the CEO slammed his fist on the table and shouted “That’s ridiculous! Find out who said that and usher him out the door! We don’t have room in this organization for people who are too weak-kneed to speak up.” All the other executives sort of cowered in silence at this display of fury. Then I simply said: “I. Rest. My. Case.” After a long pause the CEO smiled, then chuckled, then broke into a hearty laugh. The elephant in the room (the CEO’s bullying style) had been identified, and now the CEO and his team (and later others) were ready to discuss the undiscussable. They were finally on their way to taming the elephant. And taming that elephant led to identifying and taming others. Effective leaders understand the difference between implicit and explicitcommunication. The elephant—an undiscussable subject—is implicit. It’s latent, tacit, undeclared, unexpressed. 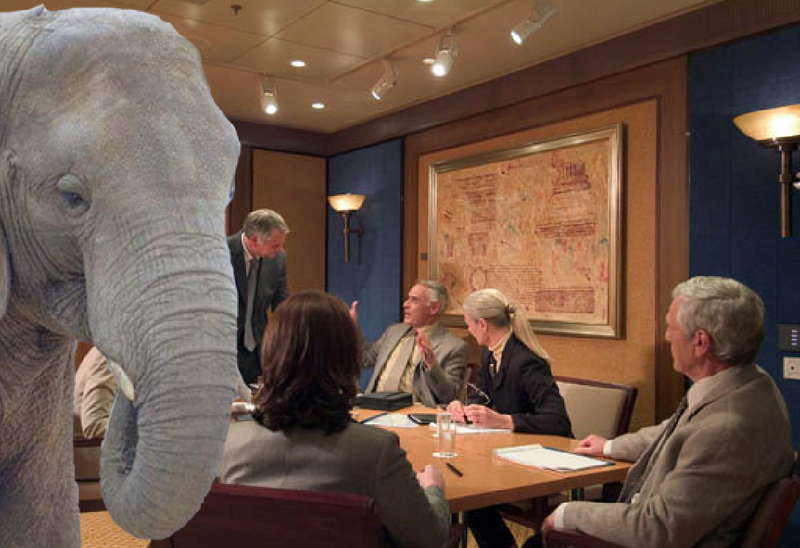 People talk around the elephant without acknowledging that it’s in the room and affecting everything that’s going on. But until the elephant’s presence is made explicit—plain, clear, straightforward, obvious—the quality of true dialogue is limited. Naming and taming the elephant is a metaphor for making implicit issues explicit. In practicing dialogue, we must be constantly alert to clues that someone may be passively accepting an idea or decision without communicating his true feelings about it. This requires focus. In our natural tendency to avoid resistance, we sometimes hear what we want to hear. In reality, we can often learn as much from what is not said as from what is. Some people hesitate in speaking up to avoid being ostracized or being viewed as “not a team player.” An individual’s private apprehension at being regarded as different is often more influential on his behavior than actual group pressure. (1) People craft messages (expressed in words and/or behaviors) that contain inconsistencies. For example, “integrity” and “accountability” may be professed values, yet team members frequently miss production deadlines and nobody raises an eyebrow. (2) Team members act as if the messages are not inconsistent. (3) Team members treat the ambiguity and inconsistency as undiscussable. (4) Team members make the undiscussability of the undiscussable also undiscussable. First, identify the elephant. An old proverb says that the beginning of wisdom is to call things by their right names. Although you always want to be respectful, identifying the elephant is not the time to mince words. Call the elephant what it is. In the case of the CEO with the “my way or the highway” leadership approach, referring to his style as merely “tough minded” would have missed the mark and might even have been accepted as a compliment. I told him he was widely regarded as a bully and that his style was having the unintended consequence of shutting down the very kind of straight talk he said he expected of his people. Third, make it safe to talk openly about the elephant. People are afraid of elephants because they don’t want to get stomped on. Good dialogue skills like listening with empathy and inquiring to discover can help create an atmosphere of acceptance so people can deal openly with their concerns. Underscore the mutual interests you share with the other players. This is also an important time for participants to relinquish power. Position and status differences have a major effect on people’s readiness to explore different points of view honestly. When I called out the CEO on his bullying tactics, he was mature and professional enough to accept the blunt assessment gracefully. He invited his team to give him examples of where his style had stymied open discussion, assured them his request was genuine, and promised there would no recrimination. This opened the floodgates of some breakthrough feedback and set the stage for candid dialogue on future occasions as well.